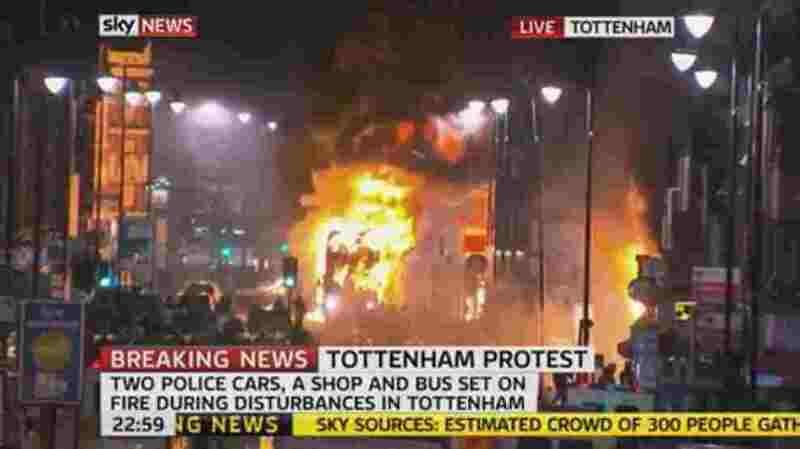 As the smoke clears after riots in several cities in the UK, including my own home city of Liverpool, the underlying question has to be asked 'why did this happen?' While some will pass it off as 'they just want to rob', that overlooks the question of WHY. I grew up in a 'not great' area of Liverpool, and just down the road is one of the most deprived areas, not just of Liverpool, but of the UK and Europe, with less than 6% going on to higher education, and over 70% of households below the poverty line. The main secondary schools in the area, were around my house, so their students all came (those that could be bothered) past my house. Now, most of the people I keep in touch with from my area growing up did go to those schools, and did not take part in the 'activities' last night. No-one is saying that just because of the socio-economic conditions growing up, people are going to riot, certainly not me. Nor is it 100% true what the DJ on the major local station was saying while this was going on “They just want to rob”. There is some aspect of that, yes, but unless you address the why, you'll never come close to addressing it. The problem is one of CONSEQUENCES. The basis of law is that society decides something, which is codified in laws. Those laws apply to everyone, and they have a consequence (a punishment) for violating them. In the UK, this has broken down, badly. Firstly, Laws are over-broad, and getting worse. Secondly, the enforcement of the laws is being applied unequally. Thirdly, the consequences are often dialled back in many cases, and taken way beyond sanity in others. Fourthly there seems to be a distinct lack of accountability within the police, and the government. The result is the sort of contempt for laws that we see in the violent actions over the last few days. The incident that sparked this, the police shooting of Mark Duggan is a good example of some of this. Immediately after he was shot and killed, news stories came out about him being 'in a gunfight', that he'd fired at a policeman. Evidence released in the last 24 hours indicates that Duggan's gun was never fired, and might not even have been immediately accessible. The policeman who was shot, was shot by another cop. The use of deadly force was thus not warranted. Will the police officer be arrested, put on remand and charged with Murder/manslaughter? Unlikely, even though this, if the latest evidence is true, a 'gun crime'. Experience tells us no. 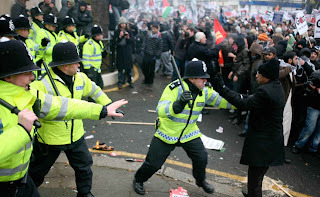 In 2009, Ian Tomlinson was attacked by a police officer and died, during a protest. He was not involved in the protest, and was walking past on his way home, yet an officer struck him several times with a baton, and pushed him over. He later died a short distance away. At first statements by the police claimed he had 'collapsed around the corner', and that police officers went to give him medical help but were being pelted with rocks and bottles. Over the next week or two, video clips were discovered that showed a very different story. They showed Tomlinson hit by a police officer, thrown to the ground, and then protesters offering medical help, while a single (plastic) bottle is thrown. An unprovoked attack, leading to death, and the initial reaction was not to prosecute. Only after significant public pressure was a decision to even take it to court made, which will happen in October 2011, some 42 months after the incident. For most of this time, the officer has been suspended on full pay. Similar issues arose in 2005 with the investigation into the shooting of Jean Charles de Menezes in 2005. In these situations, a mere 'belief' was acceptable justification for their actions. Yet it's not the London police's (Met and City of) fault alone. Police elsewhere are similarly viewed with distrust. Last week, five members of Merseyside Police's 'Matrix' task force were fired after an investigation into inappropriate behaviour, and thefts by officers at raid locations. British police reality shows (such as 'Police Interceptors' and 'Traffic Cops') have also shown police officers exceeding their authority, stretching laws, or using reactions to illegal orders as justification for arrest. Now, it's not all the police's fault. While they're being overzealous, the court system is failing society too. A series of 'initiatives' have removed any sort of consequence from the system at all. The care worker/blogger /writer winstonsmith33, for instance, paints a picture of youth offender systems that are utterly dysfunctional. Far from enforcing any sort of consequence, the system often encourages the assistance, and covering up of further lawlessness. Young teens who want to get drunk, are driven by their youth workers to get alcohol, even if the teens are already drunk. A youth offender, high on drugs, smashing up an office and threatening the staff at his hostel? He might lose his good behaviour bonus. So we have a police force that expands the laws to suit themselves, and then a justice system that spits them right back onto the streets, to carry on at the tax payers expense. Is there any surprise then, that there is little respect for the police from these groups? The unequal way the police enforce laws, their lack of accountability, coupled with the glaring indifference the police often have for concerns of the public, mean the general public now have general contempt for them. There is another aspect as well, a seeming political indifference. Banker bonuses were a huge bone of contention, as bankers which caused a massive crisis, were paid off with massive bonuses and pensions (such as Sir Fred Goodwin, who was head of the Royal Bank of Scotland when it crashed and had to be rescued at taxpayer expense, yet walked away with a £700,000/year pension). Another issue that raised public ire was the MP Expenses Scandal. The thought that MP's, some of them Ministers, committing what was essentially fraud, yet going unpunished was a major kick to credibility of the politicians. More than 100 were guilty of one crime or another, from tax avoidance/evasion, to false accounting and fraud, but only five were charged. All 5 were convicted, but the maximum sentence handed out was 16 months in prison, with three of them out after just 4 months. The rest just had to pay some of the money they STOLE back, easy to do when you earn £60k+/year. So, with a combination of over-aggressive police, a pathetic justice system for dealing with the convicted, groups of people (police and politicians) effectively above the law. Financial cuts to areas of public interest, while MPs and bankers gorge themselves at the public purse. Is it any wonder parts of the country are breaking down into violence. The police want more powers, or worse, blanket immunity. Will that work? No. It will just breed more resentment, more violence. Already police officers have too much power, which is frequently abused. The police needs to be held more accountable for their actions. The public trust has to be regained, the key word there is TRUST. More powers won't do it, instead the police need to be held to a standard which is not just the same as the general public, but higher. The role of police officer, is the embodiment of trust to uphold law and order. When that trust is broken by the officer, as well as the crime committed, the breach of the public trust has to be considered. Many countries increase punishments for actions committed against law enforcement officers, so let's apply the reverse. Likewise, we need to do the same with our politicians and judges. No-one is above the law. There comes a breaking point where police actions are deemed unacceptable, and the public snaps, as in this video clip from (I believe) Portugal. Secondly, the criminal justice system in the UK needs reform. Instead of trying to bribe the under-classes into behaving, and excusing behaviour, it needs to be dealt with, and discouraged. Those 'robbing' are doing so because they have nothing but contempt for the police. They know that if they are caught, they will often be sent to a 'home', where their every whim will be catered for at the tax payers expense. So what's left is the poor people in the middle. Those who are not poor enough to be considered 'so poor' that the state takes care of them, but not rich enough to be above justice; the taxpayer. Politicians more concerned with themselves, their own holidays, and keeping their friends in jobs and contracts, while thumbing their nose at the taxpayer. The taxpayer that, if targeted by police can lose everything, because they don't know how to game the system that sustains the yobs. A system that keeps the yobs as yobs to justify their continued existence. In a Britain this Broken, these 'riots' were inevitable. Bad politicians, untrustworthy police, a government sponsored underclass. All a product of a lack of consequence. As with medicine, you treat the disease, by treating the cause, not the symptoms. Bringing in 'The Army', rubber/plastic rounds, water cannons etc. might put an end to the violence now, but the cause of it will still be there, ready to explode at the next flashpoint. To fully deal with the situation, we need to address these wider issues, and we need to do it soon, while there's still a Britain to save. However, that's not what we're going to get. MP's have broken their holidays off early, and a special session of Parliament will convene tomorrow. Will we get a response that takes in the facts and accepts their own culpability in causing this? Unlikely. Instead we'll get speeches about how they're 'upset', and 'condemn' the rioters. We'll get more laws, and they will almost certainly be bad laws, passed in a knee-jerk fashion to stop the violence, rather than prevent it. You can stop a car with no brakes by crashing into something, but unless you fix the brakes, it will run away again the next time.